A University of Texas Rio Grande Valley student walks to class in this undated photo in Brownsville. For a machine to run well and keep running, the parts all have to work together, otherwise things fall apart. The same concept applies to sustainability: If some parts of a system work in a way detrimental to the other parts, the system is doomed to fail. It’s not sustainable. Marianella Franklin, chief sustainability officer for the University of Texas Rio Grande Valley, grapples with these issues as they pertain to higher education. In this case, sustainability means striving to achieve balance among the world’s three major systems — economic, environmental and social — as opposed to prioritizing one or two. What it’s not is strictly environmental or political, she said, arguing that sustainability relates just as much to business and organizational structure as it does to preserving forests or neighborhoods. Franklin established the University of Texas-Pan American’s Office for Sustainability in 2009 after the UT System ordered campuses to make it a priority. Franklin’s architecture background and experience working with UTPA as a project manager known for pushing green initiatives made her the logical choice. UTRGV was created by the Texas Legislature in 2013 by the merger of Pan Am and the University of Texas at Brownsville. In 2015, Franklin’s office undertook its first yearlong sustainability assessment, involving both campuses, using the Sustainability Tracking Assessment Rating System, an assessment tool created by the Association for Advancement of Sustainability in Higher Education. “We ended up with a silver rating, which is actually very good,” she said. UTRGV brought home the gold with its second assessment, which took place throughout the course of last year. AASHE announced the award in March. 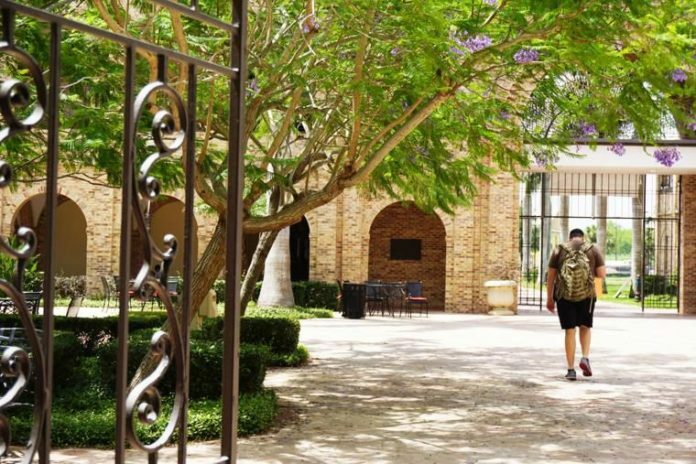 UTRGV was the only UT System institution and one of just three universities in the state to claim the distinction, Franklin said.